This is Part 2 of the Coleraine vertical described here. Actually, while Coleraine had top billing at the tasting, the vertical of Craggy Range Le Sol Syrah was probably even more intriguing. 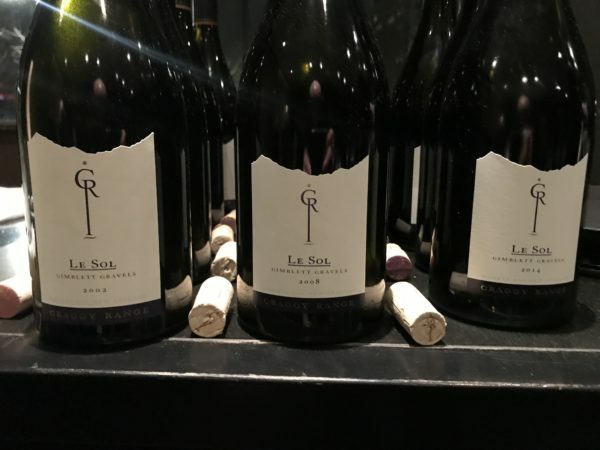 Le Sol first surged to fame as Craggy Range’s super premium Gimblett Gravels Syrah. Deliberately built in a more robust style than nearly any Gravels Syrah before it, it’s a wine that made headlines with its impact and power, no doubt helped by the personality of founder Steve Smith MW. But for all the hype, this is one wine that I’ve struggled with since the start. Many vintages – right up until Matt Stafford took over as Chief Winemaker in 2012 – have looked overwrought to me, and the 2013 was the first I really enjoyed. Too much oak, too much alcohol, not enough behind it. All show, no follow through. So with this vertical, I wasn’t sure what to expect. Were those older wines now going to show me up and look fabulous, or will it be just cold justification? In reality, it was somewhere in between. For all the foibles – like the plainly unbalanced 15% alcohol releases of the late noughties – the most recent wines post-2012 looked genuinely top class. Oceans of spice, delicacy, coiled power. It’s what I’d always wanted Le Sol to taste like. That ’15 in particular is a standout – ripe yet spicy, Hawke’s Bay Syrah of peppered fruit beauty. What’s more, some of the older wines had interest too. What’s fascinating about verticals like this is to watch the evolution with the benefit of hindsight. You can see the shifting styles from the early wines that were built to make people notice, to the recent releases that are more about nuances and terroir. From new oak to whole bunches, bold flavours to complexity. These notes were as written (quickly) on the night. They’re still more impressions than comprehensive deconstructions, but hopefully you get the drift. Sullen and very spicy, with chocolate oak a big part of the mix. Warm, raw and arguably a fraction cooked but retains the black pepper trademark. I’d argue this is more ambition than genuine fruit power and fading, but there’s still charm. 16.8/20, 89/100. (No Le Sol in 2003 due to frost). Brackish black peppercorns. A Cornas-esque, black olive tapenade nose with a waft of ham. More power than the 02 doesn’t lack flow. Maybe a bit stark on the finish. Syrah power if just a bit chunky. One of the better older wines. 17.5/20, 91/100. Lifted alcohol, leaf litter and a bit dour. I found this lacks much generosity, just alcohol. Drink up as not much fruit left. 16/20, 87/100. Leaf litter and alcohol. Not much fruit despite the obvious ripeness. It lacks the energy to carry off much and so warm and hard. I don’t like this much either. Way too much alcohol. 16/20, 87/100. Finally the balance is getting there, peppercorn cool climate Syrah signature, and even though the fruit is maturing fast, the acidity feels balanced. It’s fresh and more vital. A step forward again and a wine that is better because it’s lighter. 17.5/20, 91/100. (Le Sol was not produced in 2012 due to frost). A seismic shift in style. This is just 13% alcohol! Less oak and it feels right, with the fruit and oak in cohesion. It’s still very dense and backward but fragrant too and with that same tapenade blackness of the best vintages, but coupled to great concentration. Finally this nails the balance. Very good. 18.5/20, 94/100. What a change. This feels cooler and spicier again, with an apricot kernel edge and a real brightness. Maybe a little light in it’s red fruit? Tannins are just a little elegant too. Surprisingly pretty though Proper cool climate Syrah. 18/20, 93/100+. This is excellent. The model of what elegant and spicy cool climate Syrah should be. There’s this interplay between black fruit and almost apricot fruit ripeness, the finish elegant and perfect. It tastes Cornas like but with a real delicacy. What a transformation. 18.7/20, 95/100. ‘The best whole bunch ferment we’ve had’ according to Matt. Black fruit pastillles, powdery oak and indeed powdery tannins. Fine grip and a lithe palate of finely judged components. Really quite nice, even if it’s coming together. Best years ahead. 18.5/20, 94/100.